Scott O’Hanlon, Director of Marketing, The Waterfront Beach Resort, a Hilton Hotel, Huntington Beach, California, USA. Click here for the The Waterfront Beach Resort, a Hilton Hotel Directory listing where you'll find links to all interviews with The Waterfront Beach Resort, a Hilton Hotel in one place. Click here for more info and links to all interviews featuring Scott O’Hanlon. Paulette Fischer, General Manager, The Waterfront Beach Resort, a Hilton Hotel, Huntington Beach, California, USA. Click here for more info and links to all interviews featuring Paulette Fischer. Giovanni DeGarimore, Owner, Giovanni's Fish Market & Galley, Morro Bay, California, USA..
Click here for the Giovanni's Fish Market & Galley Directory listing where you'll find links to all interviews with Giovanni's Fish Market & Galley in one place. Click here for more info and links to all interviews featuring Giovanni DeGarimore. Jack Smith, Founder and Curator, Morro Bay Skateboard Museum, Morro Bay, California, USA. Click here for the Morro Bay Skateboard Museum Directory listing where you'll find links to all interviews with Morro Bay Skateboard Museum in one place. Click here for more info and links to all interviews featuring Jack Smith. 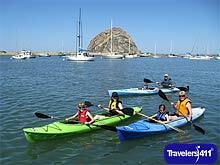 Dennis Krueger, Owner, Kayak Horizons, Morro Bay, California, USA. Click here for the Kayak Horizons Directory listing where you'll find links to all interviews with Kayak Horizons in one place. Click here for more info and links to all interviews featuring Dennis Krueger. Todd Baston, Owner, Grays Inn and Gallery, Morro Bay, California, USA. Tel: 805-772-3911. Click here for the Grays Inn and Gallery Directory listing where you'll find links to all interviews with Grays Inn and Gallery in one place. Click here for more info and links to all interviews featuring Todd Baston. Lindsey Leake, Marketing and Social Media Specialist, Bartfield Motel Group, Morro Bay, California, USA. Click here for the Bartfield Motel Group Directory listing where you'll find links to all interviews with Bartfield Motel Group in one place. Click here for more info and links to all interviews featuring Lindsey Leake.